Our volunteers make Turner’s House special with their skills, time and love for art, architecture and heritage. Become part of an incredible team delivering an exciting programme of activities and events. Be part of the incredible team that bring J.M.W. Turner’s house and garden to life. Engage with art and local history, experience working at a heritage property, be part of a friendly team and gain new skills. Dates for our 2019 volunteer taster dates will be confirmed in February 2019. Please be aware that we need a minimum of a months’ notice in order to organise a placement and we may not be able to accommodate your desired date-range. 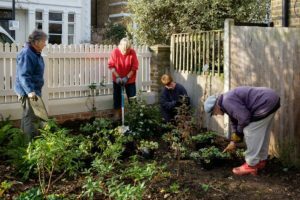 If you would like to volunteer with Turner’s House in Twickenham for your Arts Award, please look at the Arts Award page under Learning. To join as a Friend, please see under ‘Support Us’.